Everyone wants to have a clean surface, floors, walls, or even rooftops. Washing any surface can be so tiresome and sometimes we don’t get the ideal solution we were looking for. With the use of pressure washer surface cleaner, it does a magnificent job on any surface. You need to get one, especially if you’re washing large flat surfaces, since this type of cleaner is always reliable and robust. Want to clean walkways, driveways, parking lots, patios, etc. Then you might consider getting one of the best pressure washer surface cleaners to do the work for you. What Is A Pressure Washer Surface Cleaner?Why Do We Need One?What Is The Right Size?How Does A Pressure Washer Work? It is mainly a pressure washer tool that uses the pressure to clean any surfaces. If you want to clean that mess in your walkway after using a lawn sweeper, you might consider using a pressure washer surface cleaner to remove the sticky grass and mud. The cleaner allows you to wash bigger surface parts easily as well as quickly. Using a pressure washer surface cleaner will help you conserve both time and energy, since when using an ordinary cleaner you will need to scrub the space by moving back and forth to have a clean surface. By doing so, it consumes more of your energy since it is same as riding a lawnmower. If you’re using a pressure washer, you will clean faster and also avoid being tedious. Also, it saves you quite a handful of time since you can clean up to 70-90 % of the surface quicker than using the standard cleaners. 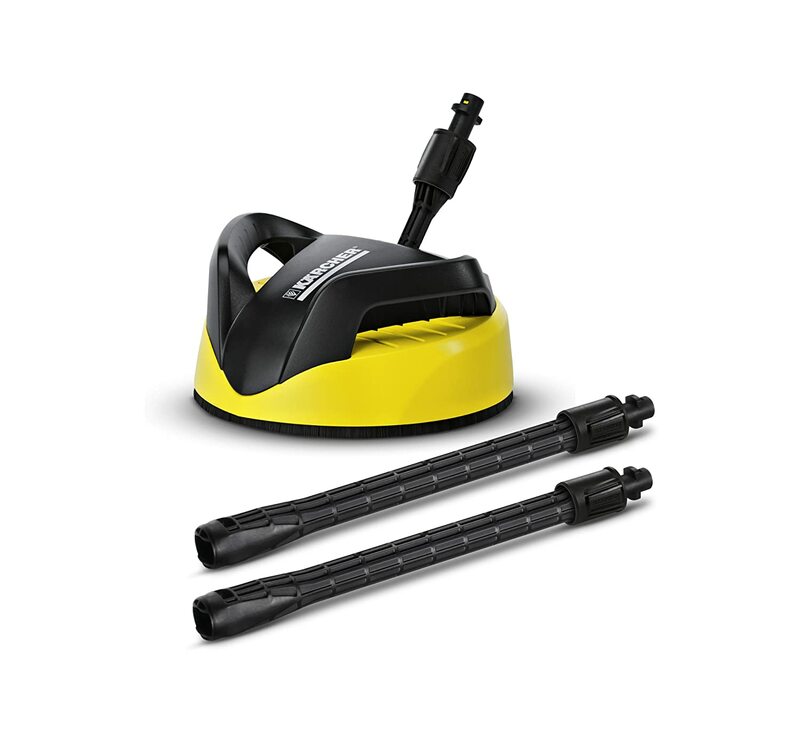 Also, if you’re want to clean walls or any other horizontal surface, the pressure washer surface cleaner is the ideal accessory to use since it uses a high pressure, use less water, and saves you a tremendous amount of energy and time as compared to a wand cleaner. A typical question that arises when one needs to obtain a pressure washer surface cleaner. You might consider going for a bigger one, but from my experience while using a pressure washer, a larger size is not always better. What you need to consider first is the surface area of the space you intend to wash. If you have a larger surface, you might use a pressure washer with a large size. A large pressure washer has a large pump which moves more water as well as creates more pressure as compared to a pressure cleaner with a small size. But the problem arises when you want to maneuver it since it becomes more tiresome and wastes a lot of time. I would suggest you use a pressure washer surface cleaner that is small in size since it’s much easier to maneuver with it, and in turn, you will cover a large area in the shortest time as possible. 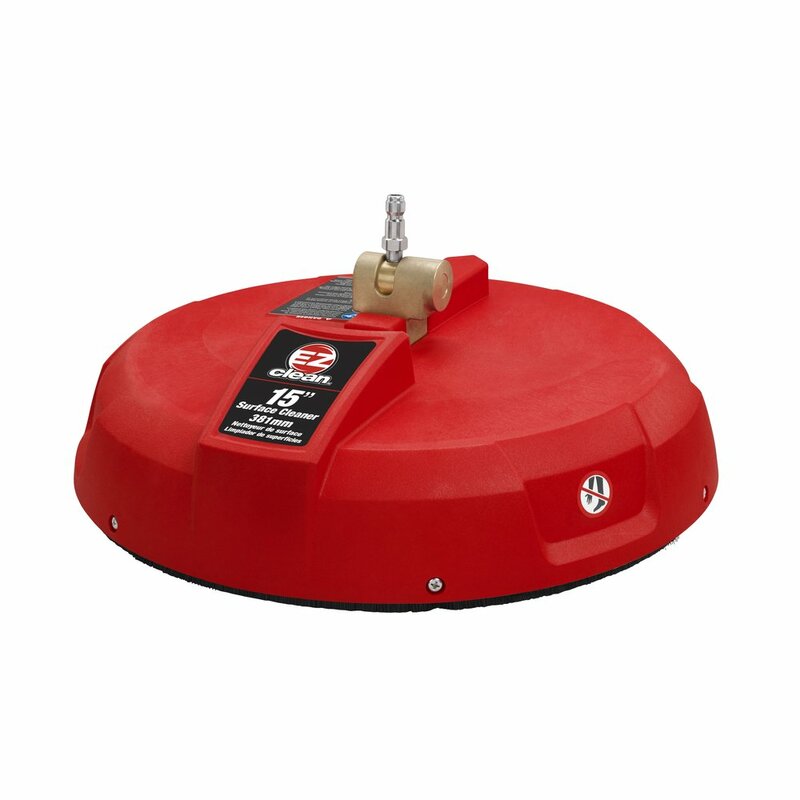 This accessory utilizes the pressure force to clean surfaces. That is not all; you will need to know the ideal way to use it to get maximum satisfaction. After you connect your pressure washer surface cleaner, pressurized water moves faster into the hose pipe and goes into the swivel on the cleaner and quickly spins the bar (which can have either a metal or cover or plastic deck material). At the end of that bar, there are always two pressure nozzles. This makes cleaning faster and easier as you simply need to walk behind the cleaner as you maneuver it in every direction to get your surface cleaned. To understand better, consider the way a lawnmower works, where it uses the pressure from gas to trim the grass. It’s the same case as a pressure washer surface cleaner, but instead, it uses the pressure of water to clean all the surfaces. By comparing to a wand cleaner, a pressure washer surface cleaner uses less water since the water comes out of your cleaner at an equal rate as the pressure. Also, while using a wand cleaner, you have no control of water overspray. While washing a driveway, for instance, I always use a lot of water while using a wand cleaner. But whenever I use a pressure washer surface cleaner I have the control of water spraying to other areas in the surrounding I have no intention of cleaning. I would recommend you take advantage of the pressure cleaner as a water saving accessory. This one of the best-rated pressure washer surface cleaner available in our markets today. 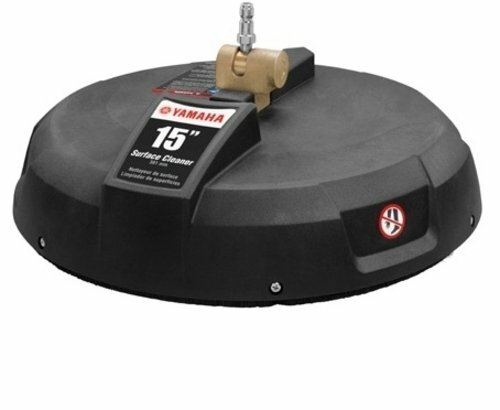 It’s a 15-inch pressure surface cleaner which is a Yamaha brand. Due to its large size, it cleans up to four times better than any other regular nozzle. This rotating nozzle offers an even cleaning as well as streak free surfaces. It has a pressure rate of 3300, making it the best pressure cleaner to clean large flat surfaces. 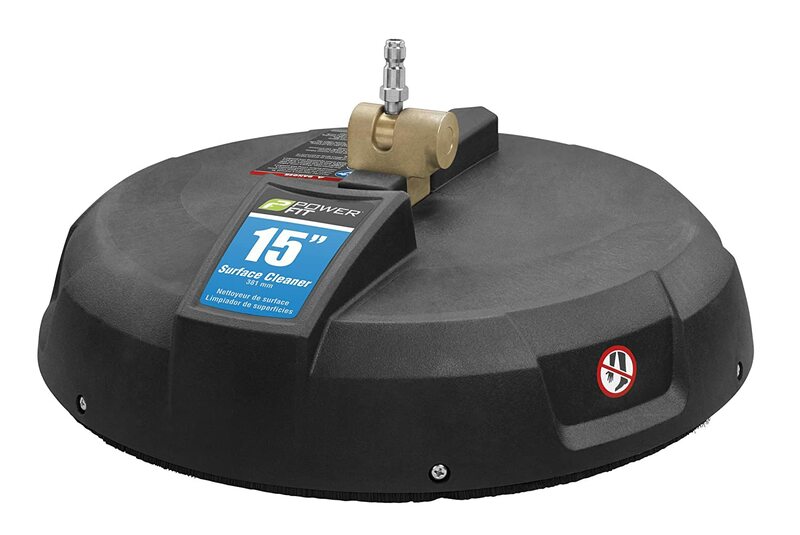 If you need a pressure cleaner that leaves no stripes or streaks, then this is the best pressure washer surface cleaner to use. You can use it to clean sidewalks, driveways, and patios up to four times better than other normal nozzles on the market. It has a coupler that connects quickly to almost every pressure washer wands. It has two nozzles with 1500 RPM, making it rotate so rapidly to give you the best cleaning satisfaction. It’s a pressure washer with 3200 PSI. It’s has a rotating jet that uses a dual high-pressure for a quick and ideal cleaning of all sorts of surfaces. The dual-pressure makes it useful in removing grime and dirt from any area you want to clean with ease. It’s a 14-inch surface cleaner, mostly preferred for extensive cleaning. It’s one of the best pressure washer surface cleaners that is in use today. If you’re looking for a pressure cleaner that does it all, then use the Karcher T250. It offers a high-quality cleaning for any kinds of surfaces. 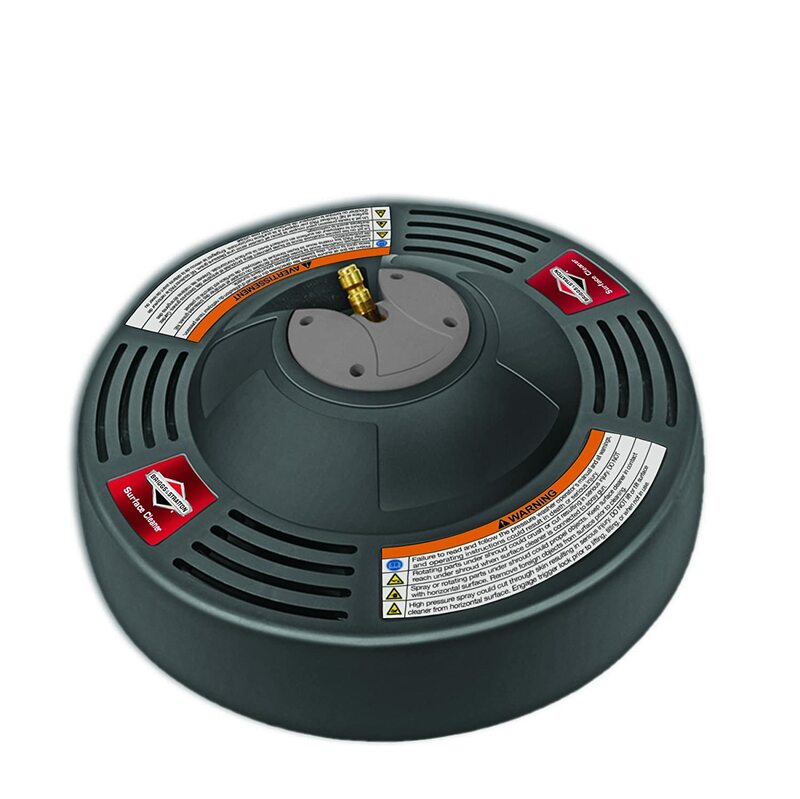 Also, you can use it with different types of electric pressure washers. It’s the best pressure washer surface cleaner that offers a versatile, efficient, and excellent performance. These are the best pressure washer surface cleaners to use for any surface cleanings. If you don’t have one, put it in your budget and obtain it as soon as possible. It will not only make your work easier but also more efficient. It can save you time that you can dedicate to other important issues in your daily life. There are many choices to choose from if you want to get the best pressure washer surface cleaners. So read this article carefully to know which cleaner suits your wants. No need to use the traditional methods of cleaning surfaces. If you found this article to be of any help, share it widely and don’t forget to comment on the suggestions box below.